Corey Seager battled injuries for much of the 2017 season. Still, he was awarded with the Silver Slugger Award in the National League at the shortstop position for the second straight season. Seager hit .295 with 22 home runs, 77 RBIs, 85 runs scored and an .854 OPS in 145 games. The 23-year-old led NL shortstops in runs, hits (159), doubles (33) and walks (67) and was second in batting average, on-base percentage (.375) and slugging percentage (.479), and third in RBIs and home runs. His 42 multihit games tied for the club lead. 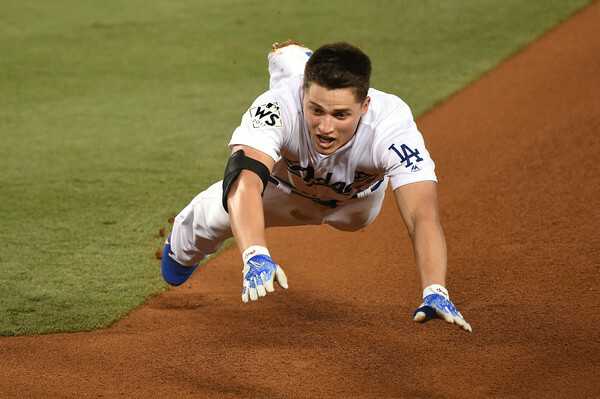 The 18th overall pick in the 2012 Draft, Seager is the youngest Dodgers position player named to two NL All-Star teams after being their first rookie shortstop All-Star since Billy Grabarkewitz in 1970. Seager became the first Dodger since Jackie Robinson to have at least 30 doubles in each of his first two seasons, and his 52 home runs as a shortstop are the most in Los Angeles history and second to Pee Wee Reese’s 122 in franchise history. The 2016 NL Rookie of the Year, Seager hit .361 with runners in scoring position in 2017, eighth in the league. His .325 average against left-handed pitching was 11th best in the league. Nice little writeup there on Seager. When he was on the field, he was truly a joy to watch hit. The guy simply doesn’t have too many slumps, and when he got into a groove into the summer it was a thing of beauty to watch until he had some hamstring problems. Then he had some arm problems. Seager should only get better with the lumber as the seasons go on. He still gives a quality at-bat every time up at this stage in his career, never conceding anything. He’s the consummate professional.